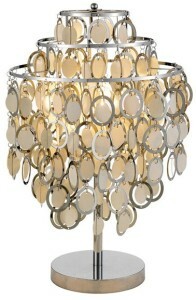 Just as the perfect piece of jewelry complements a fine dress, the right lamp will heighten the style in any room. Lamps are important accessories that liven up décor and make a fashion statement in our living spaces. Even a plain room can be rejuvenated with the addition of a stylish lamp. There are options abound with floor lamps, table lamps, and desk lamps that pop wherever you place them. 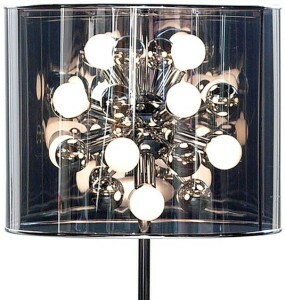 Retro Planet’s new line of Adesso lamps offers up plenty of choices: from glitzy and glamorous to modern and marvelous. They’re all designed to jazz up the interior of the home or office, and the line provides a nice balance of quality and affordability. The stunning Solaris® Lamp sports a modern, cylindrical shade with a contemporary twist. Overlapping circles have been punched out of the black fabric, allowing the light of a 60-watt bulb to shine through, creating a lovely, celestial effect. Add movement to the living room, movie room or sitting room with the Shimmy® Table Lamp. A chrome base supports three tiers of hanging paper discs that move independently in shiny chrome frames. Any air movement gets the Shimmy swaying, so put it in a room with a ceiling fan or nearby window to get the full experience. For whimsey and elegance in a cool hanging lamp, look no further than the Opera® Pendant Lamp. 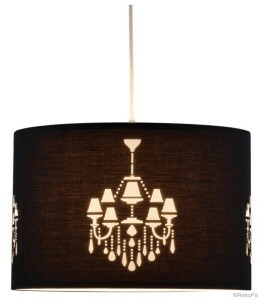 A retro-style drum shade has been laser cut with the image of a chandelier. This fanciful little lamp will look delightful hanging over your dining room table. Adesso’s visionary line provides us with a design for nearly every type of room, including modern, contemporary and mix of design elements. Best of all, the line is totally unique. Lift your lighting into the stratosphere with the Cloud® Floor Lamp. A sleek, satin steel tripod holds up a molded paper shade stretched over a wire form. This striking lamp is an excellent juxtaposition of shapes with the angled legs and rounded shade. The Starburst® Floor Lamp showcases a space-age style that’s out of this world. A cluster of chrome globes and frosted bulbs gleam brightly from within a transparent drum shade that’s lightly tinged with gray. The perfect fusion of retro and contemporary, the Starburst is ideal for living rooms, bedrooms, and even offices. Which of these Adesso lamps is your favorite? Is your style pure vintage, modern or contemporary?